When selecting apples in-store, look for fruit with good colour and a sweet smell. With so many delicious varieties available, getting to know the characteristics of your favourites will help you select the best quality fruit! Learn more about varieties here. Tip: Don’t forget to always look for the Aussie Apple sticker so you know you are buying a home-grown apple. When you get your Aussie Apples home, always keep them in the fridge as they will stay fresh and crisp for longer. If you prefer your apples at room temperate simply pop a few in your fruit bowl in the morning and they’ll be ready to go by snack time. 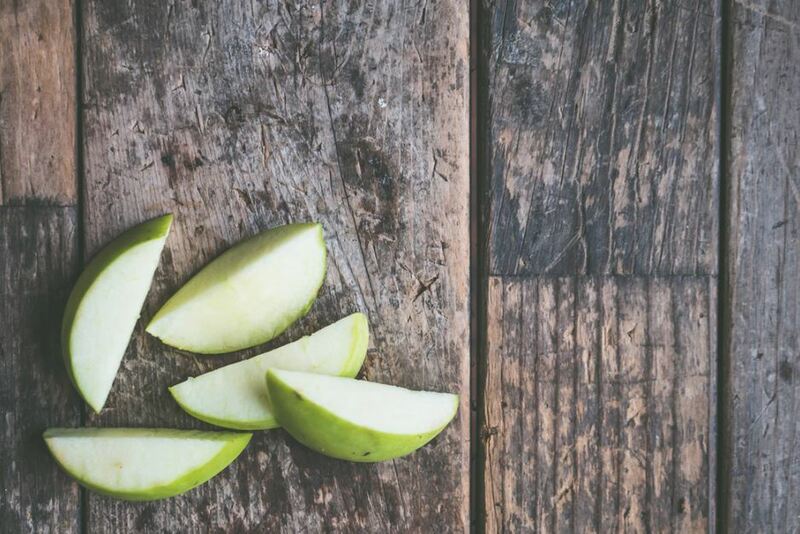 Apples are the perfect go-to snack – you can easily grab them on-the-go and they are an easy lunchbox option for hungry kids or adults. You can even make DIY apple chips that store well and are delicious to crunch on. If you’re looking for some snacking inspiration, check out our recipe page. Tip: For more nutritional benefits, eat the whole apple, skin and all. Why do apples brown? When an apple is cut into pieces, the white flesh is exposed to oxygen in the air. The apple flesh turns brown when it reacts to the oxygen, a process known as “enzymatic browning”. The name ‘enzymatic browning’ comes from the enzyme in the fruit, known as polyphenol oxidase (PPO), reacting with the oxygen in the air to turn the fruit brown. Brush or dip sliced apples in lemon or fruit juice (such as lemon, lime pineapple or orange juice). The acidic juice will slow the oxidisation keep and add sweet tang to the fruit. Cut an apple in segments and then tie it back together with an to reduce their exposure to oxygen. Not only is it super simple, it also adds a ‘fun-factor’ to any lunchbox. You can also do this with spiralised apples. Store a cut apple in an airtight container in the fridge to slow the reaction – sometimes the simple techniques are the best. When preparing a fruit salad, pair your apples with acidic fruit, like mandarin segments, to keep the flesh white and crunchy. Or whenever possible, simply chop your apples just before serving.